This week on The Revolution we’re going coast to coast and chasing the bite with our panel of pros as we beat the heat and focus on hookups. Fine tune your fishing tactics for success on the water with tips for catching slabs of bass, walleye, catfish, crappie and more. Joining The Revolution this week will be Karl Kalonka of Extreme Angler TV, Timmy Horton of Timmy Horton Outdoors, and CatDaddy. 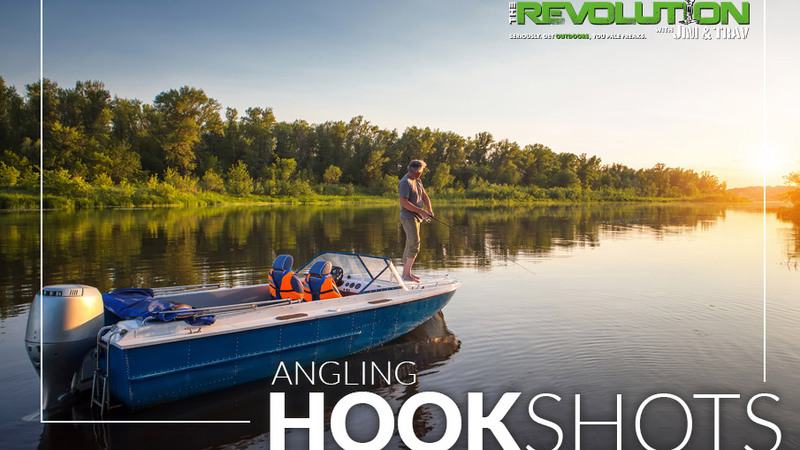 Become a master of the Angling Hook Shot this week with The Revolution, presented by Outdoor Channel, Sportsman Channel, World Fishing Network and MyOutdoorTV. Timmy Horton is a Bassmaster Elite Pro with over 1 million dollars won on the Bassmaster trail. As the host of Timmy Horton Outdoors on World Fishing Network, he strives to use his knowledge and experience to teach viewers and help them become better anglers. This week he joins The Revolution and first recaps his record on the water day at the Major League Fishing World Championship event in Texas, where six casts in twelve minutes brought 21 pounds of East Texas largemouth. Pair that with the rest of the day’s catch and Timmy had set a new single-day weight record with an amazing 88 pounds, 10 ounces on 35 fish. Timmy will then talk with Jim and Trav about crankbaits, different ways to use them effectively, as well as the tendency of the biggest fish in a school to hit them. Finally, he’ll explain why supporting and encouraging the next generation of anglers is important and how giving kids the opportunity to try fishing can spark a lifelong passion. Karl Kalonka is a master on the water and the host of Xtreme Angler TV, Xtreme Bass Angler and Xtreme Crappie Angler on Sportsman Channel, World Fishing Network and MyOutdoorTV. Tune in to The Revolution this week as Karl lays it all out on the table to advise anglers in pursuit of crappie. Tactics for targeting crappie vary, based on your location, however, Karl highlights different strategies to locate them from Ontario all the way down to Mississippi. Finding and staying on the fish requires an angler to be versatile, and Karl says the ability to take cues from the temperature, sun, wind and other variables will contribute to your success. Tune in as he talks about his go-to bait choices right now, as well as how the cooler weather of fall will change crappie behavior. “Let me tell you something. Milford Lake, the biggest lake in the state of Kansas, holds some of the biggest blue cats in the world,” says CatDaddy of CatDaddy’s Catfishin’ Adventures. While the dog days of summer and intense heat are usually clenching anglers this time of year, Kansas is experiencing a milder summer. Cooler temperatures have pushed the blue cats and they are becoming more active. CatDaddy says that Milford Lake is a destination fishery for catfish enthusiasts that want to hook up with massive blue cats. While the temperatures aren’t quite as hot, the action at the Beanhole is still smoking. CatDaddy tells Jim and Trav that he has been bombarded with monstrous catfish, 60+ pounds, that are aggressive and put up a worthy fight. He’ll explain the importance of having a good reel with a good drag system if you want to be able to haul these giant cats in. He’ll also dive into the specifics of creating and maintaining a Beanhole that will provide you with endless fishing action. Listen to find out more!